Insight and photo by Rowena Salanga, words by me. I definitely wanted to venture into new areas in terms of variation in what I post here, so I asked my dear cousin, Rowena, to share some of her food adventures every Friday, that will now be known as "Foodie Friday." These posts will consist of a culmination of both food that was made in her kitchen, as well as food ordered out at eateries here on Oahu. Let's face it, we all love to look at food at least on occasion, so I thought it would break up the monotony of my style and beauty posts. Be sure to let me know if you all like these posts down in the comments, and if there are any specifics you'd like me to address in future Foodie Friday posts. 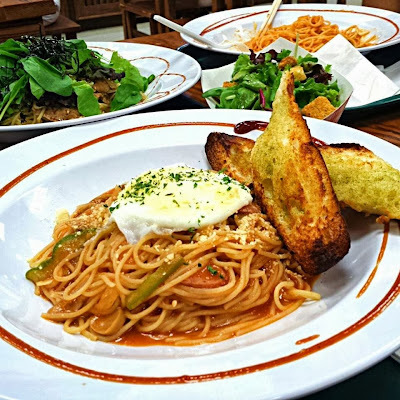 This Foodie Friday we bring you the Neapolitan and the Teri Chicken Pasta from Godmother Pasta, which is located on the 3rd floor of Shirokiya at Ala Moana Shopping Center. Godmother Pasta's food is a fusion of Japanese and Italian food, that is reflected in all the dishes they have to offer. Rowena has eaten there a total of 7 times so far, which can attest to the overall quality of the food they have available. For being a take out type of food establishment, the dishes come plated beautifully and presented in a way one would expect from a more sophisticated place. Godmother Pasta definitely provides a selection of dishes that don't seem to be very commonly available at other restaurants or food establishments, especially since the food (or at least the pasta as far as I'm concerned) is gluten free. The Neapolitan and Teri Chicken Pasta from Godmother Pasta.